Your iPhone: A Cutting-Edge Earthquake Detector? You may be holding the key to better preparedness -- right in your pocket. When you grow up in California, "earthquake drills" are as common as fire drills. A teacher announces the presence of a quake. She may simulate, unconvincingly, the shaking of walls and windows and shelves. At that point, and as quickly as possible, you crawl under your desk, crouching and collecting yourself into a ball and covering, as much as you can, your head and neck. The idea is to take up as little space as possible so that toppling ceilings won't topple onto you. The further idea is to use the rest of your body to protect the part of it that is at once the most delicate and the most important: your brain. The drills emphasize speed above all else, because, of course, earthquakes have a terrible tendency to strike at any moment. "Earthquake prediction" has long been a goal of seismologists; it's been largely, however, a quixotic one. The new island created in Pakistan last week, and the quake in Sichuan this spring -- and, of course, the devastation that struck Haiti and Japan in years past -- are, among so much else, reminders of how instant and destructive earthquakes can be. Hurricanes, tornadoes, and floods, for all their horrors, at least give some warning of their coming; earthquakes, in general, are guests that are not only uninvited, but unannounced. There's reason to think, however, that humans will soon have a leg up when it comes to anticipating, and reacting to, earthquakes. And that's because of the little computers we carry around in our pockets. Smartphones and tablets have accelerometers built into them -- the little chips that help the phone distinguish between up and down, reorienting its screen for its user. Those chips, essentially the same technology that allow automotive airbags to work, detect and record a device's movements at granular levels of detail. Which is another way of saying that an increasingly large portion of humanity is carrying extremely sensitive motion-detection technology around with them every day, and at pretty much every moment. Since it's the S-waves that tend to be the most destructive during an earthquake, the little bit of warning time that would result could be extremely valuable. It wouldn't be enough to evacuate an impact area before a quake hits; it might, however, be enough to give, say, surgeons a "stop operating" warning, or pilots an "abort landing" message. Or to give non-patients and non-passengers time to take cover under a table or in a doorway. D'Alessandro and D'Anna have published the results of their research in the October issue of the Bulletin of the Seismological Society of America. And their findings, they say, are particularly relevant to urban areas, which marry both a concentration of smartphones and a tendency to be especially ravaged by quakes. 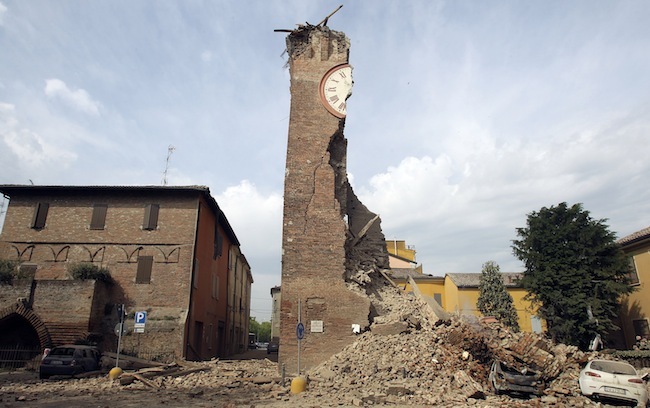 The idea would be to take advantage of accelerometers' geographical density to increase the amount of strong motion data that can be collected during a large earthquake -- to create, essentially, a "real-time urban seismic network." Not only, the thinking goes, would seismologists benefit from the resulting data about how earthquakes strike; the information would also allow first responders to quickly assess the impact of earthquakes and allocate resources accordingly. Our smartphones would make us smarter -- or, at least, better equipped to outwit nature.